It’s a title to stop most of us in our tracks: Boom Boom Extremo Bags. What’s that about? The confusion only worsens when you discover that the tale of the extremo bags is being told by a conspiracy of lemurs. But watch the prize-winning video produced by Dunedin Connections Centre and its creative space, Studio2, with fine arts graduate Megan Brady, and the story soon makes a lot of sense. It’s also a finalist in Australia’s Focus on Ability short film competition, where viewers are encouraged to vote for their favourite film. The competition is designed to encourage filmmakers to focus on the ability of people with disability. Kay Murray, Programmes Manager of the Connections Trust, says people at the Connections Centre were very aware of the damage that plastic bags were doing to the environment, especially when they end up in the water supply. At the same time, a lot of old clothing was being dumped in landfill. 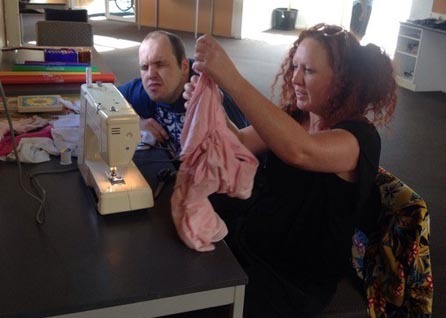 Now, in the Connections Centre workshop, this discarded clothing is being re-assembled into shopping bags stamped with the project’s logo. The bags are then available to shoppers so they don’t have to resort to using plastic bags to take their shopping home. Combining the two environmental challenges has resulted in two opportunities: protecting the planet and giving a creative project to the centre’s clients. “Making the film Boom Boom Extremo Bags was great fun for everyone,” Kay says. “We even made the music, using our soundbeam at the Connections Centre. We wanted to show that everyone can get involved in helping protect our environment. When you watch the video, you will understand why this video made it through to the final. Its unlikely, funny and furry narrators guide you through the work done by the men and women of the Connections Centre to transform an unwanted tee-shirt into a useful shopping bag. And if you want more of the lemurs and their owner, Julia Young, try catching them all on The Positivity Show on Otago Access Radio. There are 23 New Zealand entrants in the Focus on Ability Short Film Festival. A $1000 NOVA Choice Award will be presented at the Auckland screening on Wednesday 25 July and winners will be announced at an awards night in Sydney on Wednesday 5 September. Original generation time 1.6499 seconds. Cache Loaded in: 0.0004 seconds.